✈ JOIN US & SEE THE WORLD IN A NEW WAY - Are you a traveler? Does someone you know love traveling? We are travelers and we designed this Large Scratch Off Map (17 x 24") for people like you. All capitals, states or countries were drawn by hand with unstoppable passion for a creative & free world. 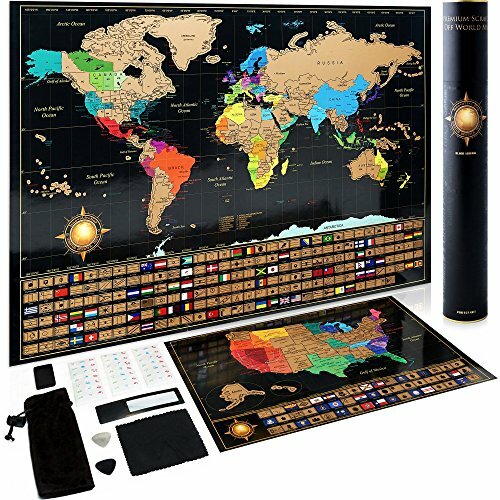 This Black & Gold Scratchable Map will not only allow to you to track your travels but also share your experiences with your friends. - Travel, Scratch & REMEMBER FOREVER! ✔ BE SURE YOU GET THE BEST QUALITY - We chose the highest quality glossy laminated paper to offer a product that will last AT LEAST until you travel all 195 countries! A thin foil protects the colors during scraping which gives you a nice & clear image of each place you've visited. NO map will ever arrive damaged considering our deluxe tube which protects your wall art 100% of the time. - We don't cut corners! If you have any questions about this product by InnovativeMap, contact us by completing and submitting the form below. If you are looking for a specif part number, please include it with your message.